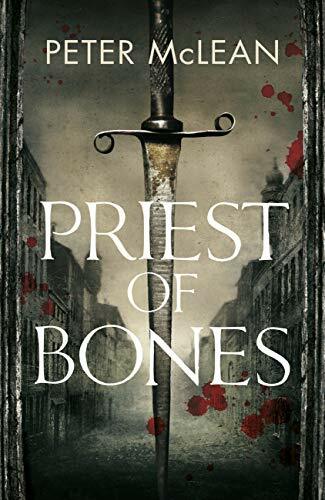 To celebrate the upcoming publication of his grimdark fantasy novel, Priest of Bones, Peter McLean on growing up, gangsters and Tomas Piety, a crime lord like no other. I was a bit wild when I was a lad. From the late eighties through to the mid nineties, I was what you might call a bit of a naughty boy. Not in a bad way, really, but I hung around with a lot of people who were. I used to skip school to work on a friend’s market stall and put a bit of money in my pocket, and that money went on going out. Back then Norwich had a thriving alternative scene, and they were my tribes growing up. Punk, metal-head, goth, I’ve been them all. I have had every stupid haircut known to man, trust me, but I certainly met some interesting people. I’ve got drunk with outlaw bikers, and had serious conversations with gents who’ve been in prison for hurting people. I’ve done drugs with professional burglars, and I’ve seen the wrong end of a gun. It’s not big and it’s not clever, but it is educational. I write about gangsters, a lot of the time, and some of Don Drake’s friends and acquaintances from my Burned Man series are heavily based on people I used to know. Gold Steevie, Harry the Weasel, Micky Two Hats, I used to know people like them. I’ve never met anyone quite as heavy as Tomas Piety from Priest of Bones, mind you, although I know people who have. I know people who’ve worked for men like Tomas Piety, and I absorb other people’s stories like a sponge. I’m sure most writers do. The Tanner’s Arms in Priest of Bones is heavily based on a pub I used to drink in, the old Festival House opposite St Andrew’s Hall in Norwich. Not its layout but its vibe, that feeling of camaraderie and home. The Fessie House regulars were like a family – everyone knew each other, and each other’s business. You knew who was proper hard and who was all talk, who you could trust and who you couldn’t, and I think some of that has rubbed off on the Pious Men. You could go in there, any hour of the day or night, and guarantee that there’d be someone you knew to talk to. I remember taking a mate from work in there one night, and he told me he was honestly scared we were going to get stabbed. I laughed at him. When the scary-looking bloke he was avoiding came over and hugged me, I think he nearly died on the spot. There wasn’t trouble though, and if there was it got sorted very, very quickly. There was a nightclub upstairs, the glorious Sam’s, and it says a lot that even on a Saturday night that was the only club in the city that didn’t have a police riot van parked outside. The Fessie policed itself, just the same as the Tanner’s does, and the coppers knew that. If I’d been a good boy I’d never have met any of those fascinating people and I wouldn’t be writing these books, and that would be a terrible shame. Of course, I’d never have met my wife either, but that’s another story. Priest of Bones is out October 4 and available to order now. Fantasy, grimdark, new releases, october, peter mclean, priest of bones, priest of lies. Bookmark.